Morrigan Press commissioned the creation of several books for Talislanta. As many of you know M.P. went through some financial hardships before the Talislanta License reverted back to Stephan Michael Sechi on April 1st 2010. Due to these monetary setbacks a dozen or so books, officially licensed Talislanta material mind you, were never published. The authors who had invested weeks to months writing these books were never compensated for their hard work. To date these books have remained manuscripts and until recently it appeared they would stay that way. 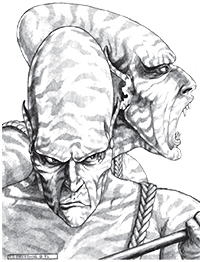 During the last days of September 2009 SMS rocked the community with the news that the Talislanta RPG had seen its last printing. He would follow this news by announcing Talislanta would be laid to rest in the hands of its loyal fan base, released under a Creative Commons License. Within hours the community was asking if this CCL would include unpublished Talislanta manuscripts. SMS nonchalantly responded giving the manuscripts the thumbs up. For the next six months virtually no information would appear in the public eye. For all intents and purposes the approved resurrection would appear to have ground to a halt and forgotten. Enter project coordinator Doug. Doug was one of the authors who had produced a manuscript and he knew a couple of other authors he thought might be sitting on some unpublished work. He went ahead and looked into it and he was shocked by what he found. There were roughly a dozen manuscripts spread across eight different authors, all saddened that their work would never be published but even more so that Talislanta fans would never get to experience the new content they had created. When I learned what Doug was up to I asked if I could interview him. I was elated when he said yes. The interview is extremely informative and contains the behind-the-scenes story of how this project came together. Today I am proud to announce that the first of these books has been released and I have created the official page for The Lost Books of Talislanta. As new books become available we will be updating this page and of course be announcing such awesomeness in news articles. Rejoice today as Jhangara has arrived! Grab it NOW!! It is simple to say that Jhangara is a swampy land surrounded by twin forks of the Axis River and the Azure Ocean. Perhaps too simple. For most foreigners however, that is all that they see and therefore all that they report of this savage land. But, to its native inhabitants the Land Between the River is full of different regions, all coexisting with a sense of balance. The exact origins of the Jhangarans are lost to time. They are often seen as primitive savages by the rest of modern Talislantans. While in some aspects this is true, the Jhangarans are still heirs to a culture that goes back several centuries, if not millennia. This book explores the history, landscape, flora and fauna, and secrets of this inhospitable southern land. This entry was posted in Lost Books Project News, Website News, Website News - New File Added. Bookmark the permalink. Both comments and trackbacks are currently closed. Great! It looks great, too! Paul, the man turning these pure text books into presentable PDF documents, has really outdone himself. I’ve seen the rough draft, near-final, and finalized version of this document. The man is doing simply outstanding work. Thank You PAUL!! A special thanks to Douglass Bramlett for being so kind as to release his hard work to all of us for free. The quality of the writing is top notch and is conveyed in an attractive “chatty yet informative” manner. I can’t tell you how thankful I am for donating all of this new content for Talislanta. Your magnanimous spirit and altruistic mindset are humbling. Huzzah! The Lost Books are finally coming out. Jhangara is literally the tip of the iceberg here folks. There are so many great works coming your way. We want them all in a beautiful condition, however. Paul (our PDF guru) has done some amazing work with Jhangara considering that all he had to start with was a simple word document. It’s really my pleasure to work on the PDFs of the Lost Books. I get to read all of this great stuff, and then help get it out there to other fans in a format worthy of its quality. Look for more releases very soon! Yes, Thank You very much guys for making this possible for all the Talislanta fans out there!